With our long-life ECOSYS and highly efficient and highly reliable TASKalfa technology, Kyocera provides the industry’s most comprehensive line of award-winning low to high-volume color and black and white A3 size (supports up to 11” x 17”) copiers and multifunctional products (MFPs) that will help improve the workflow and efficiency of any size business. With our long-life ECOSYS and highly efficient and highly reliable TASKalfa technology, Kyocera provides the industry’s most comprehensive line of award-winning low to high-volume color and black and white A4 size (supports up to 8.5” x 14”) copiers and multifunctional products (MFPs) that will help improve the workflow and efficiency of any size business, in a small footprint. 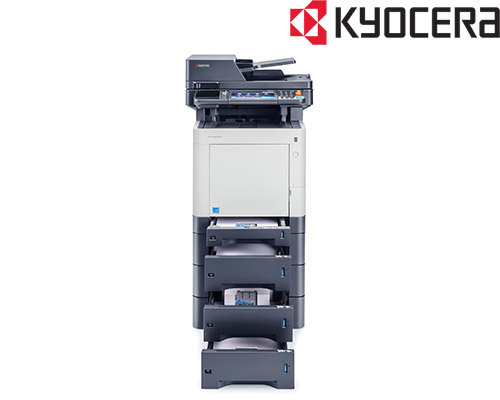 With our highly reliable and long-life ECOSYS technology, Kyocera provides highly regarded and highly rated network laser printers that deliver high-resolution output with bright color and crisp black and white text and graphics for any size workgroup. Kyocera’s wide format products copy, print and scan architectural and engineering sized drawings with outstanding 600dpi image resolution and low operation cost. Transform hard copy document distribution and storage into a simplified, digital workflow. Easily capture, store, share and retrieve your documents. Take advantage of printing and scanning capabilities on the go from today’s mobile & cloud technology. Print your business documents and dynamic forms from virtually any environment. The ECOSYS M6535cidn color multifunctional printer elevates desktop power and flexibility to the next level. Superior output at speeds up to 37 pages per minute in black and color, plus productivity-enhancing business applications power document imaging across the workgroup. Print, copy, scan and fax capabilities from a single device bring added convenience, streamlining hardware requirements in a small footprint. A tablet-like color touch screen adds effortless operation at the device, while optional wireless printing and standard Apple AirPrint™ capabilities address the needs of a mobile workforce. The result is a document solution that is highly efficient, yet still budget conscious. Click here if you need a quick solution to a technical problem using our live remote-assistance tool. We invite you to find out more about our service offerings. Please contact us to discuss how we can help you. Copyright © 2019 Reliable Copy Products.